PQ 303 (2011). Hilary Calvert to the Minister of Science and Innovation (16 Feb 2011): Can he confirm that the ‘seven-station series’ has been replaced by a series described on NIWA’s website in December 2010 as the “revised seven-station series”? Dr Wayne Mapp (Minister of Science and Innovation) replied: No, the seven-station series on NIWA’s website is an update, and not a replacement. Why say that? What purpose could it serve? It seems to suggest that NIWA want to smuggle their 7SS off the stage without anybody really noticing. They seem more interested in semantic tricks than in simply stating “we were wrong, but we have now corrected our mistakes”. It is well established that NIWA produced the new series only because the Coalition so strongly and persistently criticised the old series. Last year, a major firm of spin doctors, Network PR, advertised that they had been retained to defend the Institute from this ‘sustained attack’. Can we see the hand of the spinners in the current attempt to deny that a series has been replaced, even when it has been superseded? Superseded, but not replaced, replaced without being superseded — or neither, but only updated? Oh ho, what an inscrutable juxtaposition! What linguistic obfuscationist’s joy! The old series had no scientific standing because NIWA could no longer explain the adjustments they had long ago made to the raw thermometer readings. But if the new series is only an “update” (nudge, nudge, wink, wink) then they sidestep the issue of why they went to the expense of reconstructing the damn thing in the first place. Remember that the review required a special funding allocation, involved five scientists and took nearly a year to complete. Some update! 7SS1 = superseded, unrevised, old, original, replaced, substituted, pre-update, un-reviewed, obsolete, out-dated, archaic, previous version, 1992 version, Salinger version, unmodified, out-of-favour, demoted, incorrect and misleading. NZT7 = revised, new, replacement, updated, substitute, modified, subsequent, state-of-the-art, 2010 version, BoM-reviewed version, re-considered, official, corrected, improved, modernised, re-modelled and fixed. So, what does NIWA mean when it says that the 7SS1 has been “superseded” by the NZT7? The online dictionary defines “supersede” as “to replace one thing by another held to be more valuable or useful, or less antiquated” (notice the word “replace”). “Replace” is defined as “to substitute for another which has ceased to fulfil its function.” That is just what NIWA did when it put the NZT7 on its website as “the current live version” and got rid of the 7SS1. This is an intriguing claim. As we read the review report, we got the impression that almost all the adjustments in the 7SS1 are abandoned in the new NZT7. We had to check this out, so we compared the two spreadsheets HERE. The result is spectacular. The series covers 100 years. No less than 98% of those years now have different temperatures. Surely it’s a galactic understatement to describe 98 changes out of 100 as “a few”? We also painstakingly compiled a Schedule of Adjustments for the NZT7, and compared that with its counterpart for the 7SS1, published by NIWA in February 2010. The comparison is HERE. The 7SS1 contained 52 adjustments. An amazing 51 of them have been changed in the new NZT7. How can 51 out of 52 be fairly described as “a few minor changes”? Drs Wratt, Renwick and Mullan need to face up to the facts. The new series uses a completely different methodology and comes up with an entirely new set of adjustments – so that only 2% of the annual temperatures have survived unchanged. The old one covered the period from 1853 to 2000, while the new one goes from 1909 to 2009. The report itself (page 3) admits to “structural changes”. But it’s a replacement — root and branch! Would one of the good doctors, or anyone else, care to explain to the NZ public why NIWA misled Dr Mapp, who then misled Parliament, into believing the NZT7 is “not a replacement”? And, perhaps, er… why? 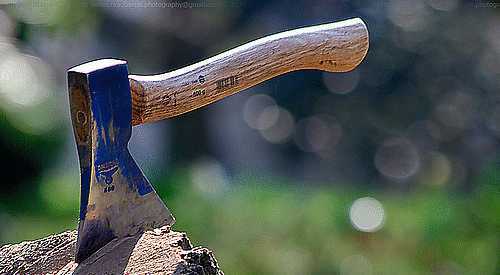 Good article, and my family had an axe just like yours, handed down from father to son over the generations. How could the hon. Minister say what he did with a straight face if he’s in on the secret? And if he is not, Niwa owes him a few explanations. Australia’s Tim Flannery made some dodgy comments that are getting him seriously laughed at right now. NIWA is becoming a potato of considerable warmth that ministers should be very wary of handling otherwise they will be sharing the limelight with Aussie Tim. On any public infrastructure project, whatever the cost, the time frame or the popularity of the project, the news that no progress would be detectable for several hundred years would end support for it. Period. It seems our leaders hope things might be different with anthropogenic global warming. I will be watching the Australian protests against their ‘carbon tax’ closely. The one rally they have already had drew several thousand. Should they start getting up some momentum it might pay to start similar protests here to rid ourselves of our onw ‘carbon tax, the ETS. Has anyone noticed the deafening silence from Christchurch mayor Bob Parker on Earth Hour 2011? This was a big deal last year. Isn’t it time for all these selfish deniers in refugee city to turn off their lights (if they are actually on) and help save the planet? So, now NIWA have axed the dictionary? In fairness, the NIWA scientists are fully engaged in manipulating their statistics. They hire Network PR to manipulate the words, and to write the replies to Ministerial Questions. Isn’t it typical spin doctoring to deny that an update can also be a replacement? Let’s see how it works. You take a list of numbers called Series 1, then you “update” some of the numbers to produce Series 2. Now Series 2 immediately replaces Series 1, does it not? If not, the two Series must maintain an uneasy co-existence, perhaps competing for attention, until one emerges as the victor and eventually replaces the other. These public spats are all just word games, aren’t they? And the shame of it is that none of this bears any relation to climate science. “The king is dead. God save the king”. This seamless transition from monarch to monarch is a source of pride in British realms. But does anyone claim that the dead king carries on “updated”, even after the new king is handed the orb and sceptre? Richard, can you provide a cross-link to your related piece on 7SS – RIP? (#8552 it seems). Doesn’t the new series look exactly like the old one, with 0.91C/century, +/-0.26C? All that work a moot point? Yes. Despite a plethora of different adjustments (based on different subjective choices) which produce different temperatures in 98 out of the last 100 years. Like the old series, the random adjustments of the new 7SS don’t move in both directions and cancel out. Instead 90% of them contribute to a warming trend – and accumulate to reach approx 1°C/century. How did this entirely different series end up with the same curve as the old series? One explanation is that the trend is so obvious it will emerge regardless of method. Another possibility is that the revised series was manipulated to ensure it looked similar to its predecessor. Which explanation is closest to the truth? Three phases: cooling, warming then cooling again. Clearly, the main contributors to the +0.91 C/century linear trend are Auckland, Nelson and Hokitika. They show a continuous warming trend from start to approx 1980 (Nelson, the entire series) but the other 4 show a cooling phase for the first 15-25 years, then a warm phase, then a cool phase. Obvious too, is that Auckland is unrepresentative compared to the other 6 locations being approx 2.5C warmer than the next location. It only takes 3 adjustments, 1 for each location in the early years of Auckland, Nelson and Hokitika to change what could be a cooling phase to a warming phase in those locations. Those 3 then influence a linear trend in a manner contrary to the predominant trend of the other 4 but the early cooling phase is still evident in the polynomial trend of the NZT7 composite series. Using a polynomial trend, the warm phase was only between 1940-1980 approx. for Masterton, Wellington, Lincoln and Dunedin. The difference in absolute value between 1909 and 2010 for the composite series only being approx 0.7C but that difference is reducing. 5 of the 7 locations show a cooling phase at present. Of the other 2, Auckland has topped out and only Nelson shows a continued warm phase. The same can be said for other global metrics. The focus is kept on the “long-term” linear trend but this is totally misleading. The trends are curves and the most recent trend in the curves is deceleration. A linear trend will immediately mislead anyone who cannot differentiate between deceleration, constant rise and acceleration. I suspect many people interpret constant or decelerating rise as acceleration in the case of sea levels for example. A situation that certain factions are quite happy with and that includes the NZ Royal Society (Manning, Hunter et al) much to their shame. They should be educating – not misleading. They should be educating – not misleading. They should be axed, not parleyed with. But then you would have to have a democratic/capitalist infrastructure to effect. Not something we might enjoy these days. Must’ve missed it. Sorry, will try to remember next year to hire a WWII Dad’s Army spotlight and siren for the event. Richard C – I presume you mean “since 1980”. What is the linear trend of the NZT7 from 1979 to now? Or the polynomial for that matter? As this is a 30-year period, I guess it would be taken as sufficient to establish a trend. I presume you mean “since 1980″. No, since about 1992 (since about 2000 for the composite). Bear in mind that I started the graph for the individual locations at 1913 when all 7 can be compared on like-for-like basis. What is the linear trend of the NZT7 from 1979 to now? Or the polynomial for that matter? Using the NZT7 composite, the trend was up from 1979, topped out at about 2000, now down. Using the 4 similar locations, the trend was starting to turn from up, topped out at about 1992, now down. As this is a 30-year period, I guess it would be taken as sufficient to establish a trend. Yes but what type of trend, linear or polynomial? The linear trend is up, the polynomial trend is down. The polynomial trend is a more valid and sensible representation I think.